Gun Fury is a 1953 3-D western film directed by Raoul Walsh and starring Rock Hudson and Donna Reed, with major supporting roles for Philip Carey and Leo Gordon. The film is based on the novel Ten Against Caesar by Kathleen B. George and Robert A. Granger. The supporting cast includes Lee Marvin and Neville Brand. It was filmed in the Red Rocks area of Sedona, Arizona. Raoul A. Walsh was an American film director, actor, founding member of the Academy of Motion Picture Arts and Sciences (AMPAS) and the brother of the silent screen actor George Walsh. 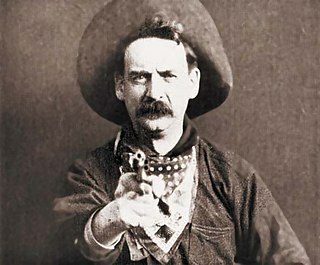 He was known for portraying John Wilkes Booth in the silent classic The Birth of a Nation (1915) and for directing such films as The Big Trail (1930), starring John Wayne, High Sierra (1941), starring Ida Lupino and Humphrey Bogart; and White Heat (1949), starring James Cagney and Edmond O'Brien. He directed his last film in 1964. After a stagecoach holdup, Frank Slayton's (Philip Carey) notorious gang leave Ben Warren (Rock Hudson) for dead and head off with his fiancée. Warren follows, and although none of the townspeople he comes across are prepared to help, he manages to recruit two men who have sworn revenge on the ruthless Slayton. Donna Reed was an American film and television actress and producer. Her career spanned more than 40 years, with performances in more than 40 films. She is well known for her role as Mary Hatch Bailey in Frank Capra's 1946 film It's a Wonderful Life. In 1953, she received the Academy Award for Best Supporting Actress for her performance as Lorene Burke in the war drama From Here to Eternity. Roberta Haynes is a retired American actress, active from 1949-89. Leo Vincent Gordon was an American film and television character actor as well as a screenplay writer and novelist. During more than 40 years in film and television he was most frequently cast as a supporting actor playing brutish bad guys but occasionally played more sympathetic roles just as effectively. Lee Marvin was an American film and television actor. Lawrence Neville Brand was an American actor. His most memorable film roles were in Stalag 17 (1953), Riot in Cell Block 11 (1954), and Birdman of Alcatraz (1962). Brand was also a highly decorated World War II combat soldier. Fireside Theatre, a.k.a. Jane Wyman Presents, is an American anthology drama series that ran on NBC from 1949 to 1958, and was the first successful filmed series on American television. Productions were low budget and often based on public domain stories or written by freelance writers such as Rod Serling. While it was panned by critics, it remained in the top ten most popular shows for most of its run. It predated the other major pioneer of filmed TV in America, I Love Lucy, by two years. The Meteor Man is a 1993 American superhero comedy film written by, directed by, co-produced by and starring Robert Townsend with supporting roles by Marla Gibbs, Eddie Griffin, Robert Guillaume, James Earl Jones, Bill Cosby, and Another Bad Creation. The film also features special appearances by Luther Vandross, Sinbad, Naughty by Nature, Cypress Hill, and Big Daddy Kane. Townsend stars as a mild-mannered schoolteacher, who becomes a superhero after his neighborhood in Washington, D.C. is terrorized by street gangs. The 23rd Golden Globe Awards, honouring the best in film for 1965 films, were held on 28 February 1966. Screen Directors Playhouse is an American radio and television anthology series which brought leading Hollywood actors to the NBC microphones beginning in 1949. The radio program broadcast adaptations of films, with original directors of the films sometimes involved in the productions, although their participation was usually limited to introducing the radio adaptations and taking a brief "curtain call" with the cast and host at the end of the program. During the 1955–56 season, the series was seen on television, focusing on original teleplays and several adaptations of famous short stories. Laredo is an American Western television series that aired on NBC from 1965–67, starring Neville Brand, William Smith, Peter Brown, and Philip Carey as Texas Rangers. It is set on the Mexican border about Laredo in Webb County in south Texas. The program presented fifty-six episodes in color. It was produced by Universal Television. The series has a comedic element, but, like another NBC series that premiered in 1965, The Wackiest Ship in the Army, it was an hour in length, had no laugh track, and characters were not infrequently killed in it, thus going against three unofficial rules for sitcoms at the time. Bob Glaub is an American bass player and session musician. He has played with such artists and bands as Journey, Steve Miller Band, John Fogerty, Bruce Springsteen, Bob Dylan, Neil Diamond, Jerry Lee Lewis, Ringo Starr, Dusty Springfield, Aaron Neville, Linda Ronstadt, Stevie Nicks, Jackson Browne, Warren Zevon, Donna Summer, John Lennon, Rod Stewart, Crosby, Stills & Nash Bee Gees and many others. Windjammer is a 1937 American film directed by Ewing Scott. The Americans is a 17-episode American drama television series that aired on NBC from January to May 1961. Set during the American Civil War, the series focuses on two brothers fighting on opposite sides of the conflict. Guest stars included Lee Marvin, Jack Elam, Brian Keith, Kathleen Crowley and Robert Redford, among many others. Beyond Mombasa is a 1956 Technicolor film directed by George Marshall filmed and set in Kenya. It stars Cornel Wilde and Donna Reed. Ten Wanted Men is a 1955 Technicolor Western film directed by H. Bruce Humberstone and starring Randolph Scott.